Bali has diverse landscapes however the temperature is warm all year round which means no worries for carrying bulky winter wears. Bali is an ideal place not only for backpackers but also for couples and families where they can enjoy trekking to volcanoes or basking in the sun on the beach. So, while packing for Bali, here are some of the essentials which I think might be useful. Sarongs - A multipurpose sarong is very much essential to pack as it is required in most of the temples. Loose, Light and comfortable clothing are much preferred for a humid temperature like in Bali. Packing Tip: Always travel light and make sure to respect the nature and culture of the other country by adopting sustainable travel items. Sad to see Bali is one the most vulnerable place in the world for plastic pollution. I usually carry Metal straw, reusable bags, boxes and water bottles. Do try and promote the local food places (known as warungs). Purchase from locals and encourage others too! Avoid single-use plastic as it destroys the marine life and I am sure together we can make the difference. Let Bali or rather any country in the world be the way it is so that locals and tourists can enjoy in the years to come. Bali is quite extensive and each area has its own beauty. Read about must know before travel to Bali. 1. Visit Ancient Temples: Bali is full of culture and one can see a number of ancient Hindu temples with intricate carvings and centuries-old magnificent architecture. Each has its own history and story. Experience the magical sunset at Tanah Lot or the ruins of Goa Gajah near Ubud or the temple on a cliff in Uluwatu or the picturesque temple Ulun Darun Beratan temple against the hazy, dreamy mountain background. Drive on any route and one can see magnificent temples. 2. Explore Beaches or Waterfalls: Bali beaches are some of the most scenic beaches. South of Island has white sand coasts like Kuta, Nusa Dua and Sanur while the cliff guarded shores of Uluwatu, Padang Padang, Dreamland are worth visiting. The striking black sand beaches on the North and West shorelines with sleepy untouched coves in between is a must visit. Waterfalls are quite common. Ride on any unknown roads and be surprised with the nature. 3. Spa or Massages: When in Bali the whole travel activities can be quite exhausting and let me tell you, Bali has the best of scenic spas to vitalise the body or calm the mind. With all traditional treatments using local healing oils and herbs, Balinese Spa offers an unforgettable rejuvenating experience. Some of my favourites include Riverside by Maya, Five Elements Puri Ahimsa, Karma Spa at Ungasan. 4. See the Balinese Dance: There can't be a better way to soak in the culture of Bali than to introduce yourself to the Live dance shows performed against the backdrop of gorgeous ancient temples or modern amphitheatres with the dramatic light and sound effects. The most popular and legendary dance performance is the one-hour Kecak Fire Dance at the Uluwatu Temple which starts around sunset. Barong and Kris Dance are also quite interesting which intrigues the audiences with the mythological stories. The performances are held daily and one can get the ticket before a day or the same day in the morning. Ubud Palace or the Lotus Temple are the prominent places in Ubud to watch the shows. 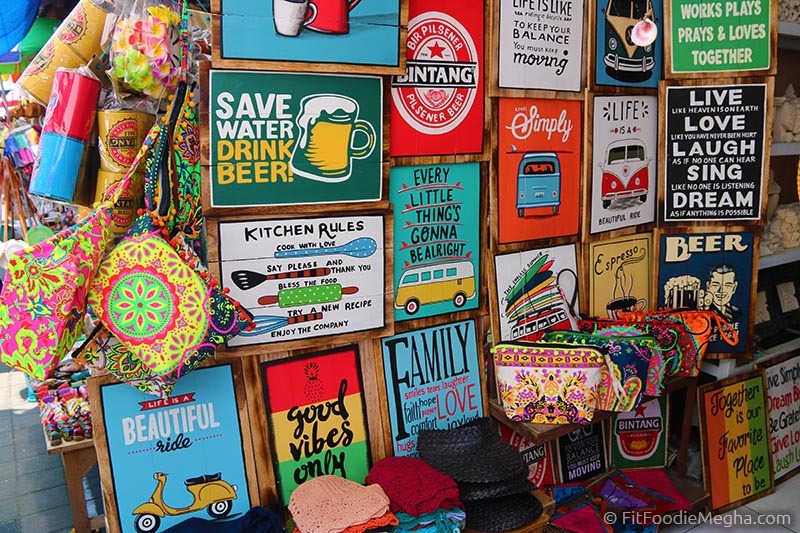 The prices range from 70k to 100K IDR depending upon the tourist season. 5. Adventure Activities: Being an island, Bali is also known for adventure activities like Snorkelling, Scuba Diving or Surfing. We did not explore much of that side but you can anyways try out in Nusa Dua (Sanur Beach), Nusa Lembongan, Pemutaran. Ask local people or your hotel or tour operators for references. 6. Learn local cooking: The best way to explore the foodie in you is to attend a guided culinary tour. From hands-on cooking experience to the walking tour, Bali has it all. One can register for such classes or tours on the recommendations by the locals or check them online. 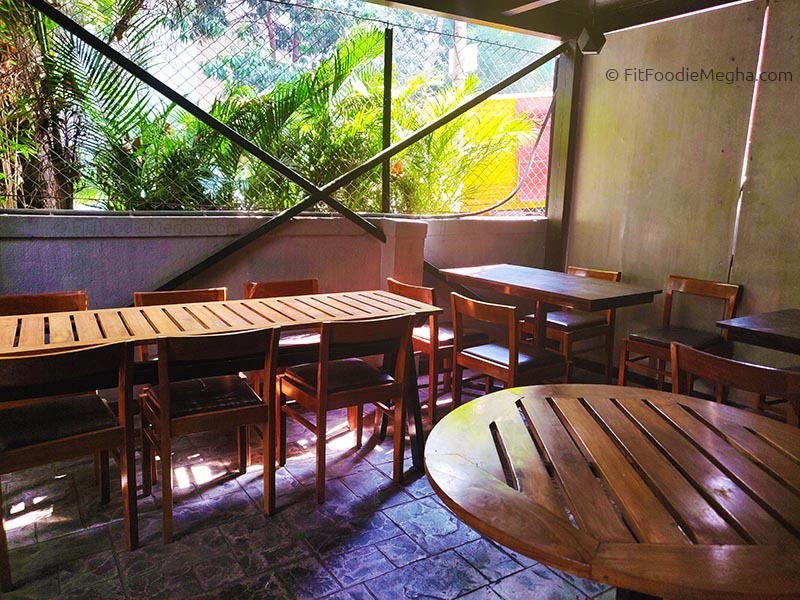 From family-run affordable warungs to fine dine restaurants, one can get to try the different cuisines. Bali is relatively easy to explore. For a convenient tour covering the sights and making most of your time, planned tours or chartered taxi is quite popular. There are no set rates for hiring a car, negotiation is the key. You can ask for hotels or resorts you staying for planned tours or bike rental. Fun loving explorers with some time in hand can rent a motorbike. But be sure to hold an International Licence, Insurance covered and that wearing the helmet is compulsory. Those who are solo and do not wish to ride a bike but still want to enjoy can take the option for motorized rickshaw (bemo in local language). Go-Jek is certainly a helpful app for such motorbike rides and ordering food at your convenience. I found taxis a bit expensive. However, renting a car for the whole tour is easier and hassle-free. We preferred self-drive motorbikes and the rents were also economically ranging from somewhere 50K IDR to 150K IDR per day excluding petrol. Bali island has a wide range of local and international cuisine suiting every palate and budget. 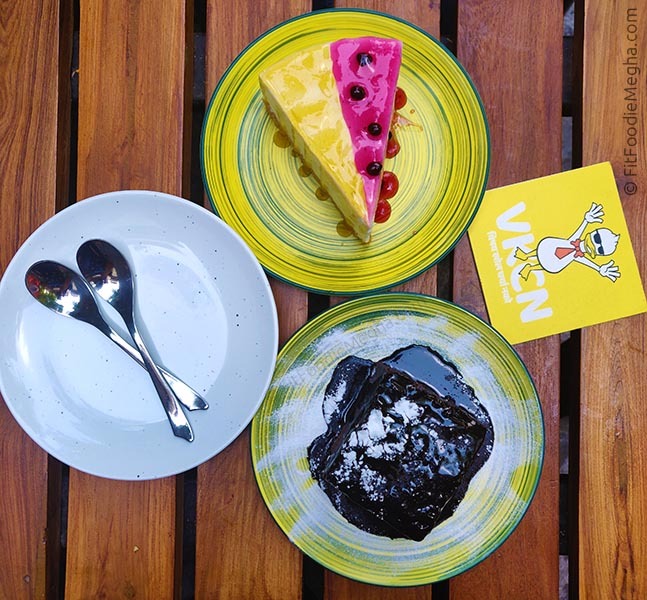 There are different varieties from street food to local food (warungs) to fine dines presenting fusion and an international menu including vegan. We would suggest trying some local food. 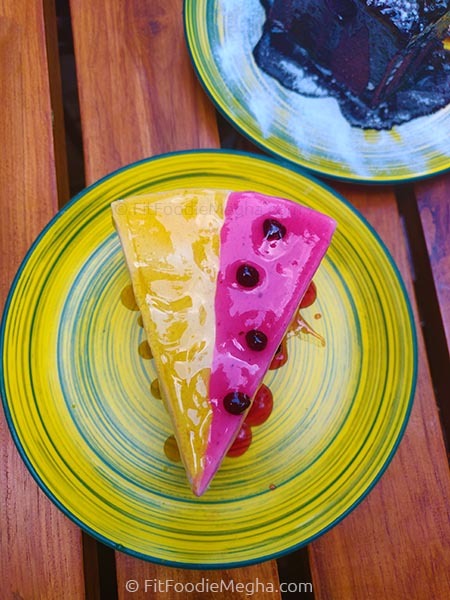 Also, when in Ubud, do try the Zest Ubud, Yellow Flower Cafe for some scrumptious healthy meal. Cafes are quite popular too. 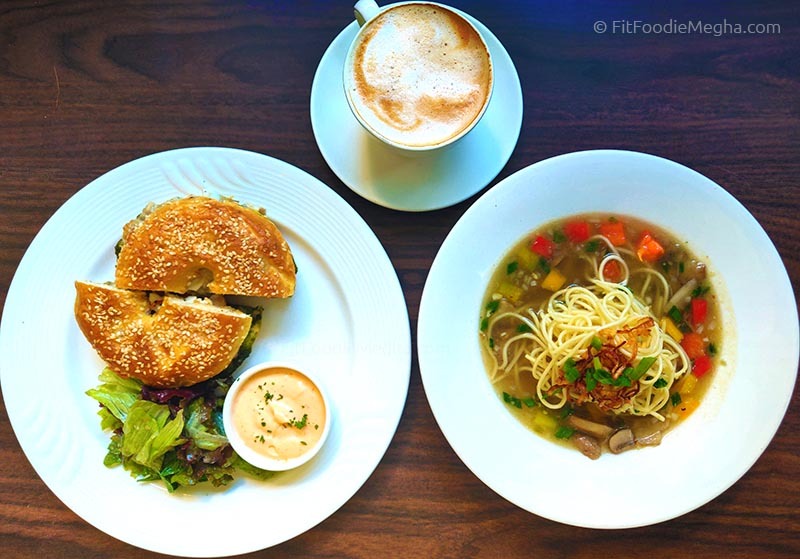 One meal ranges from around 300K IDR for a medium range restaurant. Bali has some amazing handicrafts, local boutiques, international labels, art galleries, antique furniture, colorful dream-catchers, delicate jewellery, masks, fabrics to name a few. You need to carry some cash as not all places accept cards. 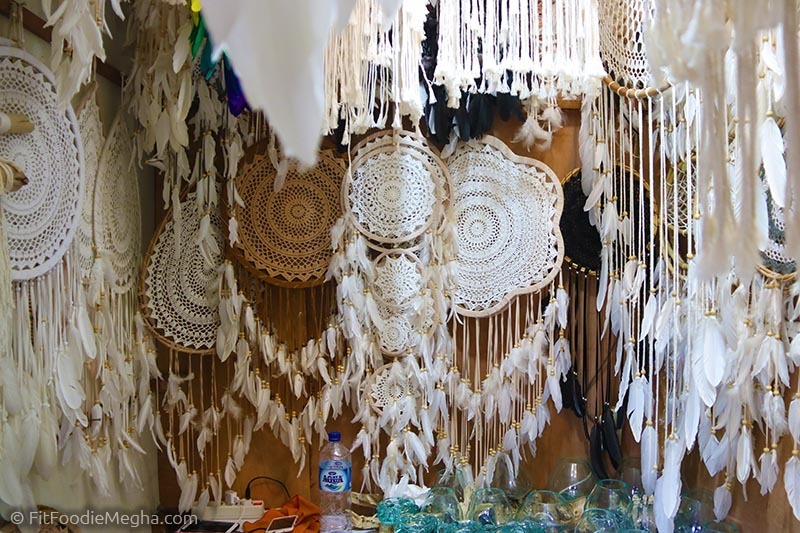 If you want to grab some souvenirs do read our experience at the top Ubud Market Souvenirs. 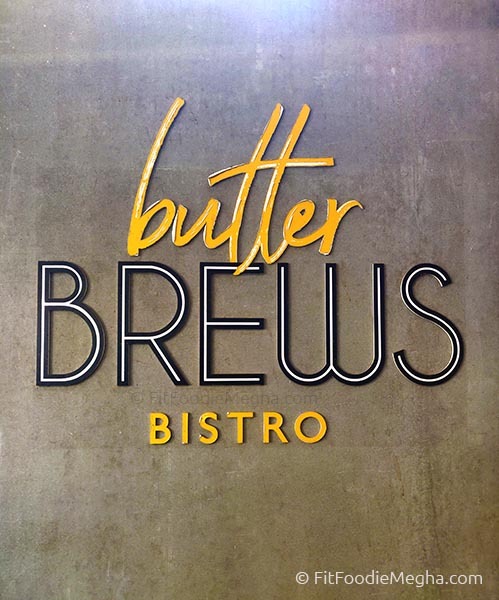 Butter Brews Bistro – Coffee, Bagels and More! — Reviewed! 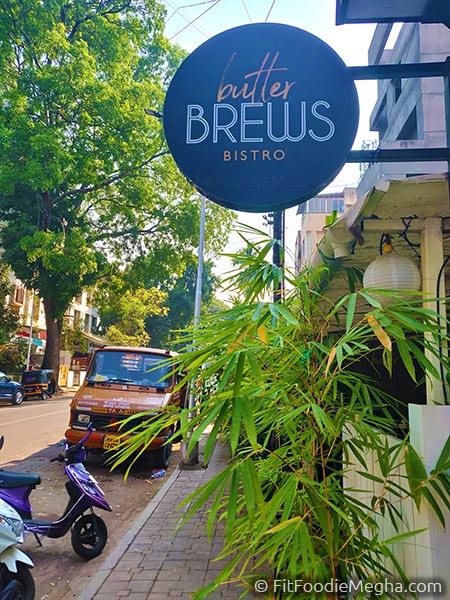 Butter Brews, a 10-months old bistro, located in the by-lanes of Model Colony, is a new impeccable neighbourhood place serving some amazing range of menu including All Day Breakfasts, Bagels, Sandwiches, Pasta, Coffees and more. 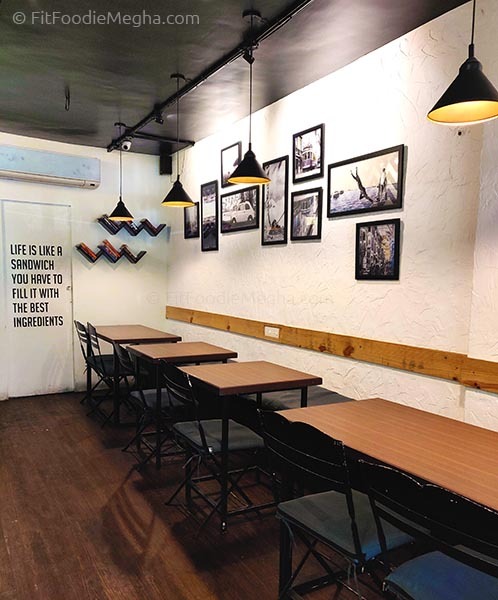 With minimal interiors, the small space bistro has indoor and outdoor seating. Parking is across the street. 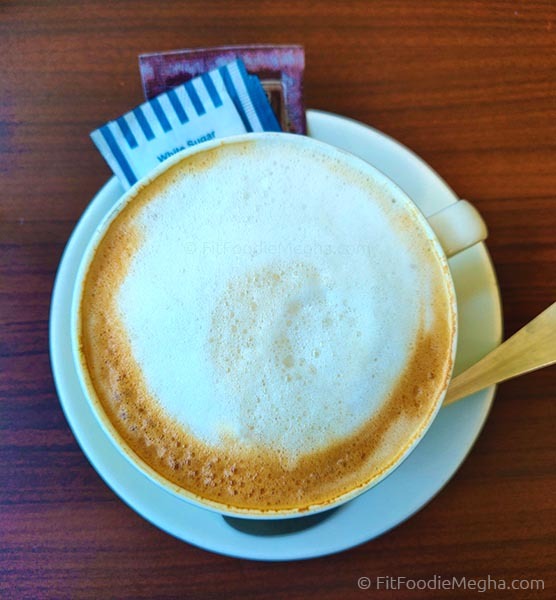 Paired my perfect cup of frothy cappuccino with the Tartines (Rs.200). Since I wanted to try two flavours hence asked for the assorted one. However, one serving had a fresh salad and 2 toasties of the same flavour. 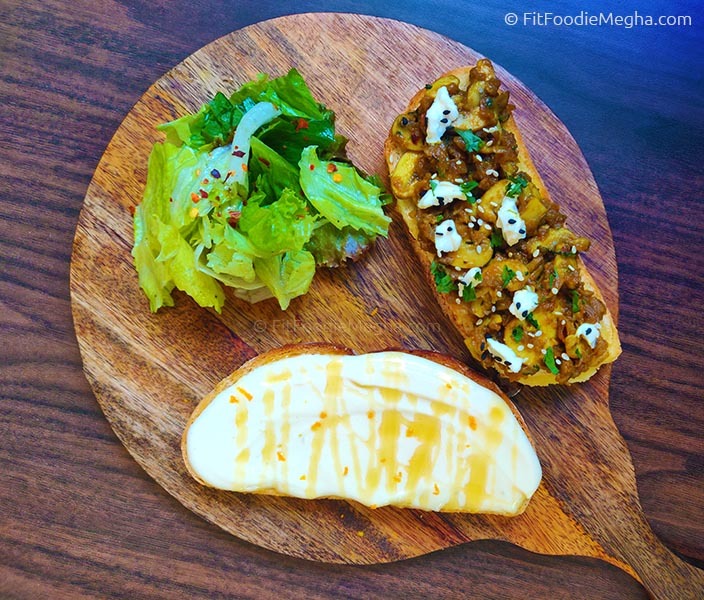 The one I ordered was Citrusy Orange Zest flavoured Cream Cheese topped with honey and the other one was Mushrooms tossed in a housemade Indian spice mix topped with cheese. The Citrusy one was my favourite as the luscious cream cheese was scattered with orange zest to balance out the flavour. The in-house baked bread was fresh and delish. The Mushrooms in Indian spices was spicy as contrary to the cream cheese one. 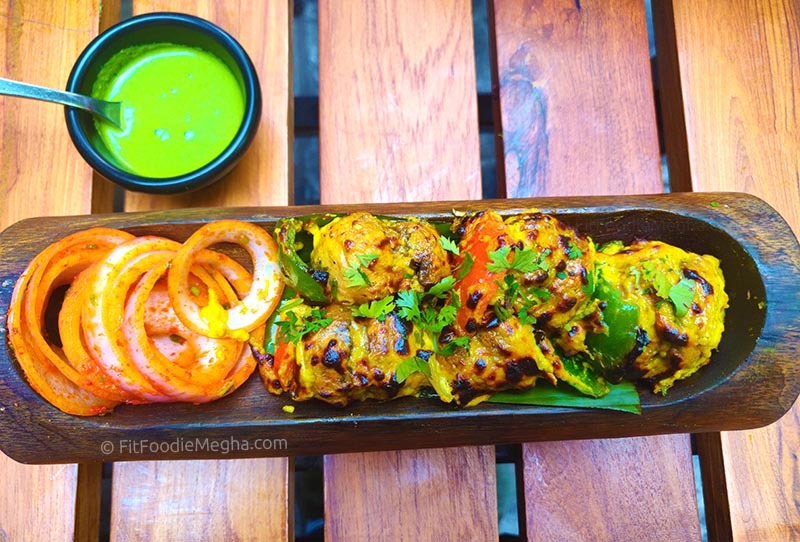 The earthy, Indian taste and texture of mushrooms was a delight. 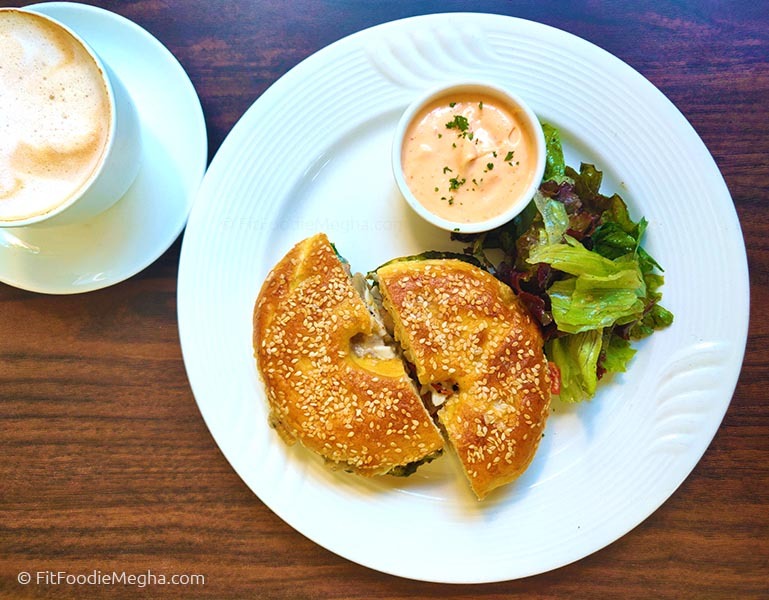 This was the first time I tried the Bagel Sandwich (Rs.220) and quite liked it. 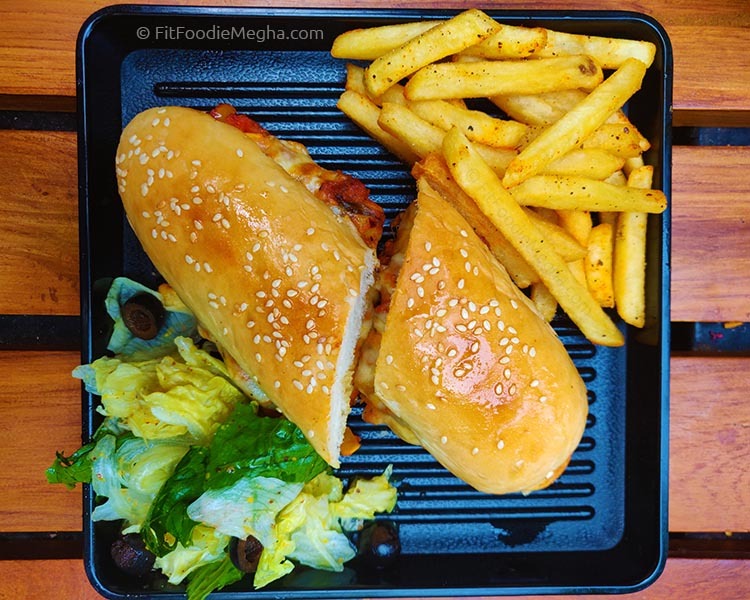 The filling sandwich had mushrooms, baby corn, bell peppers in the creamy Mushroom sauce along with Mozzarella Cheese. 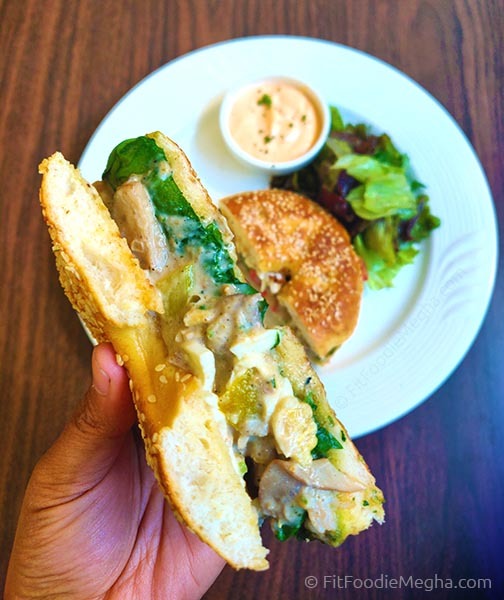 The toasted Bagel is a real treat which you surely do not want to miss. Star dish of the lunch meal was the 'Broodles' (Rs.230), a combination of Broth and Noodles. 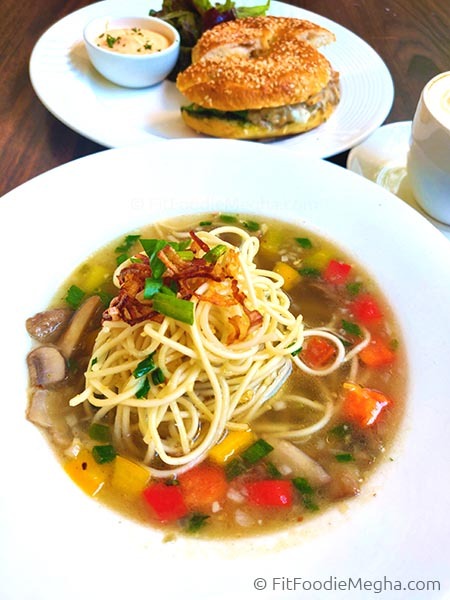 Available in both veg and non-veg variants, the Veg Broodles had Veggies in Asian spices and thin noodles in the flavourful broth. A perfect, hearty, warm bowl of deliciousness! Highly Recommended! 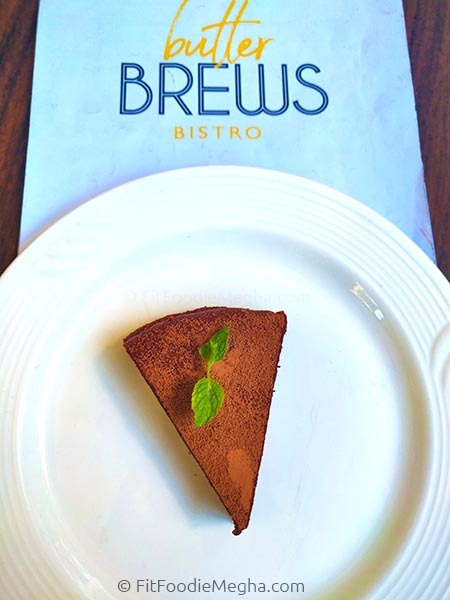 What better than to end a meal with the healthy Keto-friendly chocolate pastry (Rs.180). 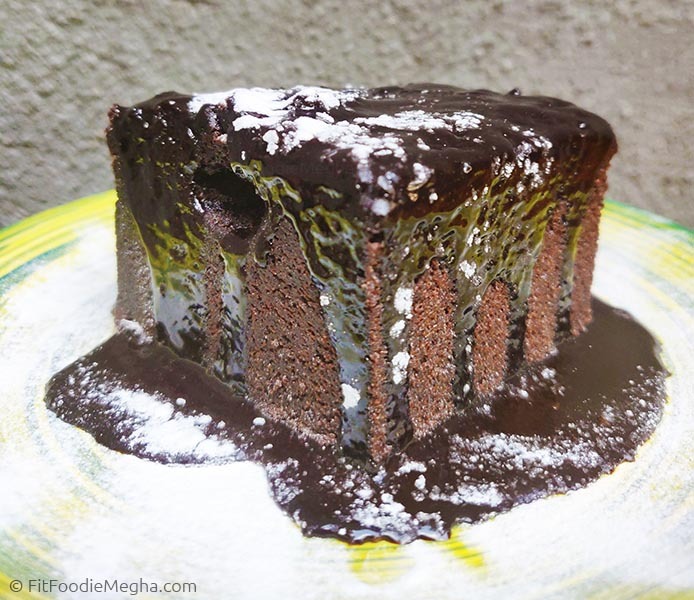 Sugar-free, Flourless pastry was dark, dense and chocolatey and be devoured guilt-free. A true indulgence for one and all! 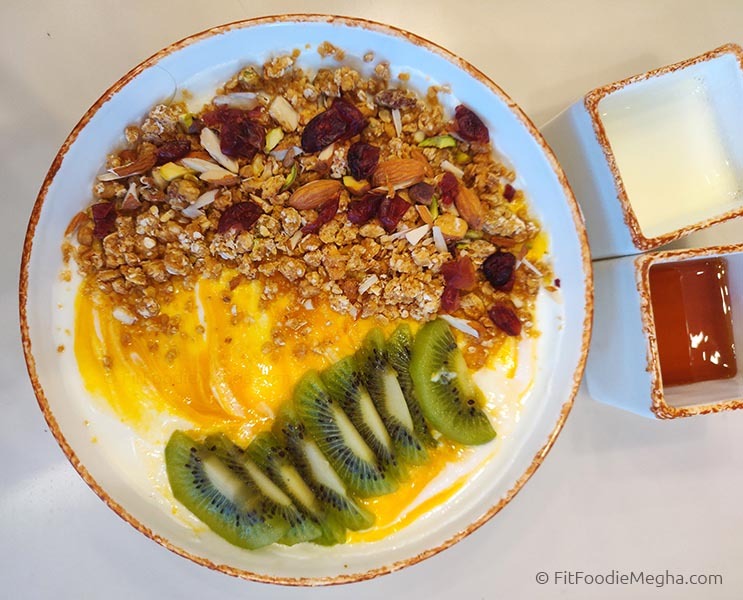 Healthy and Delicious Breakfast at Kalinga Veg Gourmet Kitchen! — Reviewed! 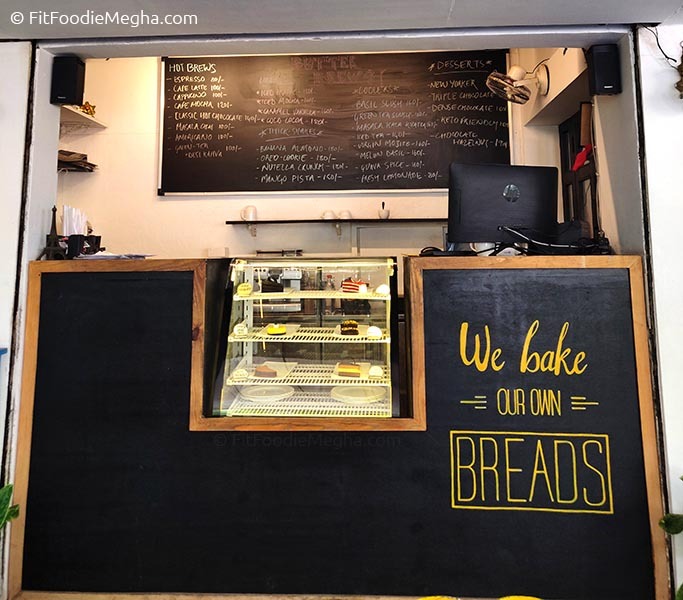 Kalinga Veg Gourmet Kitchen, located in Erandwane, has quickly gained popularity and love because of the scrumptious 'Gourmet' food. 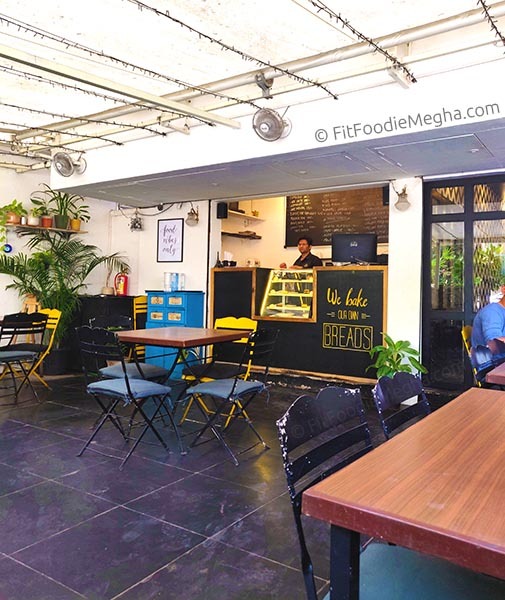 I visit them frequently and glad to know they have recently introduced the A La Carte Desi-Videshi Healthy Breakfast menu which starts at 8 in the morning. 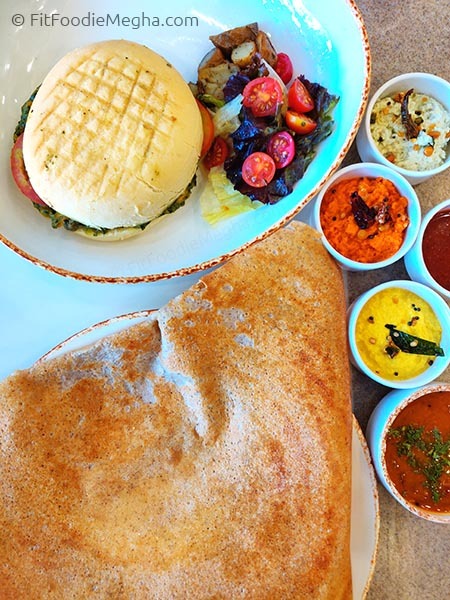 The fantastic blend of Ragi, Pearl Millet, Sorghum, Green Gram, White Lentils and Caraway Seeds not only makes a Multigrain Dosa (Rs.200) wholesome but also delectable. 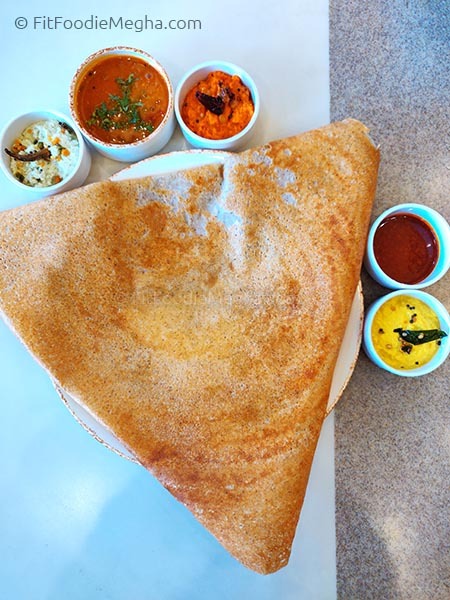 To make it even nourishing, the crisp dosa is cooked in ghee and served with multiple delicious, tangy, sweet and spicy chutneys. All of them were equally delicious but my favourite was Onion, Ginger one and Molahapodi mixed with ghee. 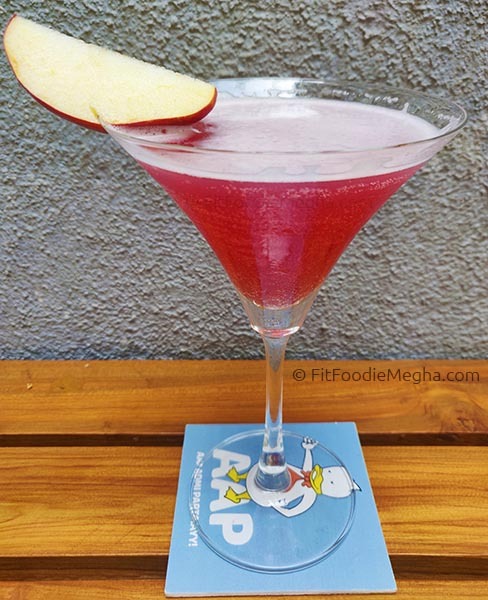 Listed under Muffin Sandwich on the menu, the savoury Popeye (Rs.200) Muffin was lip-smacking. 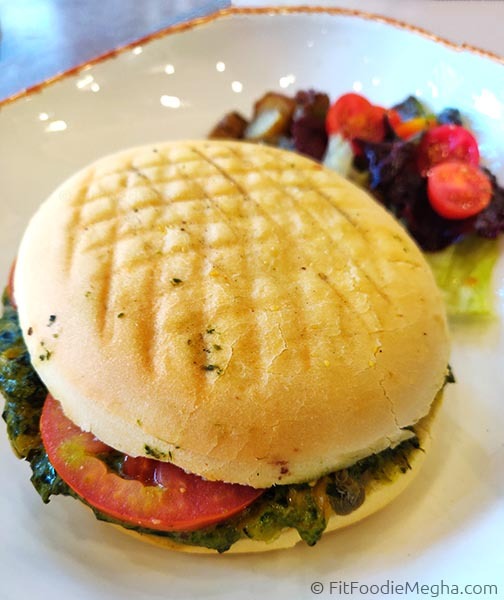 The generous spinach and corn filling with tomato slices were sandwiched between the bread was served with the portion of fresh salad. I loved it! 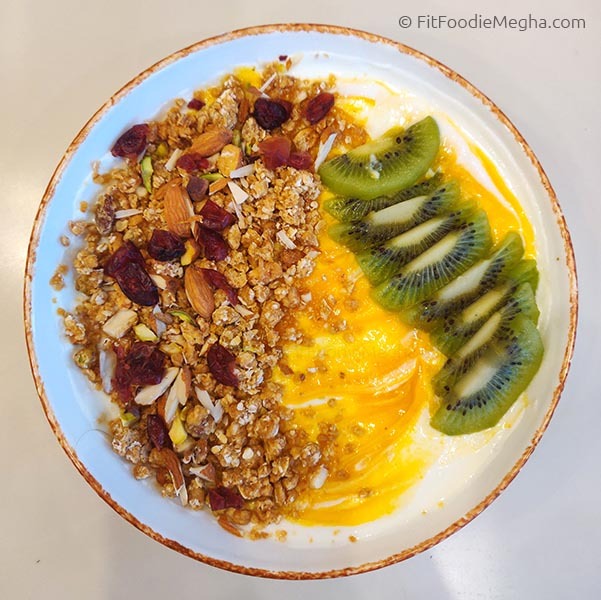 Out of the many delicious bowls like Fruit Bowl, Overnight Bircher Muesli, Nutty Banana Oatmeal, I was quite excited to try the Granola Crunch Bowl (Rs.200). Tangy, Sweet whipped Greek yogurt was topped with toasted nuts, granola, and seasonal fruit. I wish it had more of fruits. 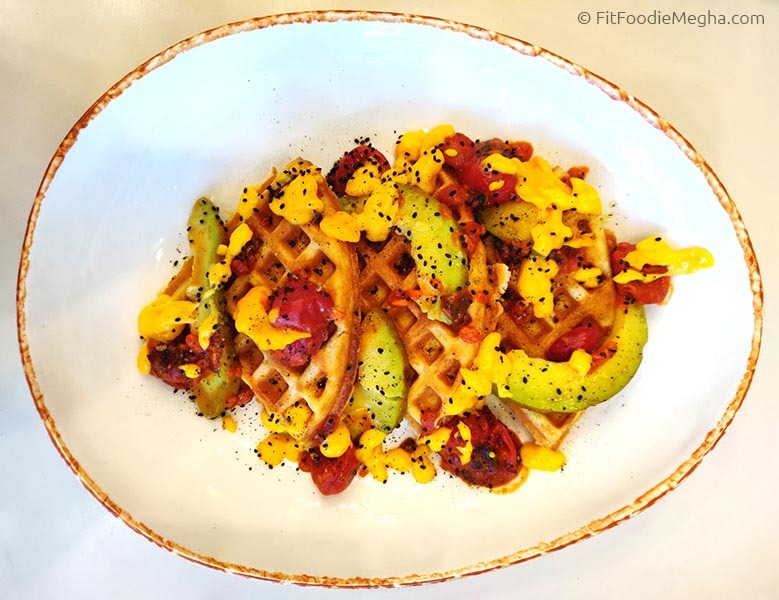 The most delectable dish which I tried from the menu was the Powerhouse Waffles (Rs.200). 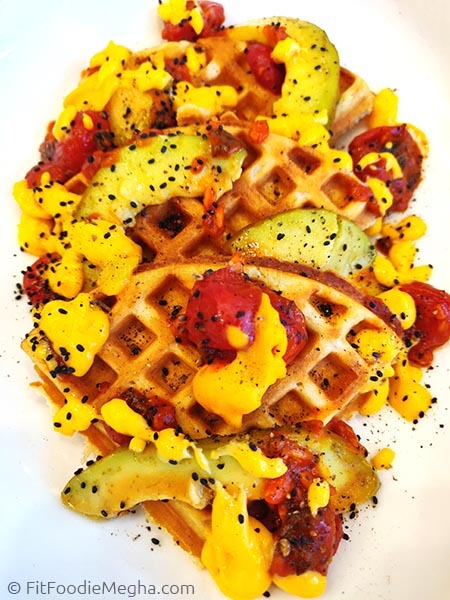 The flavoured soft yet crisp waffles were topped with the power-packed avocados, grilled tomatoes, cheese sauce, chia seeds and black peppers. This was very much filling. With each bite, there is the burst of flavours in your mouth. Highly Recommended! 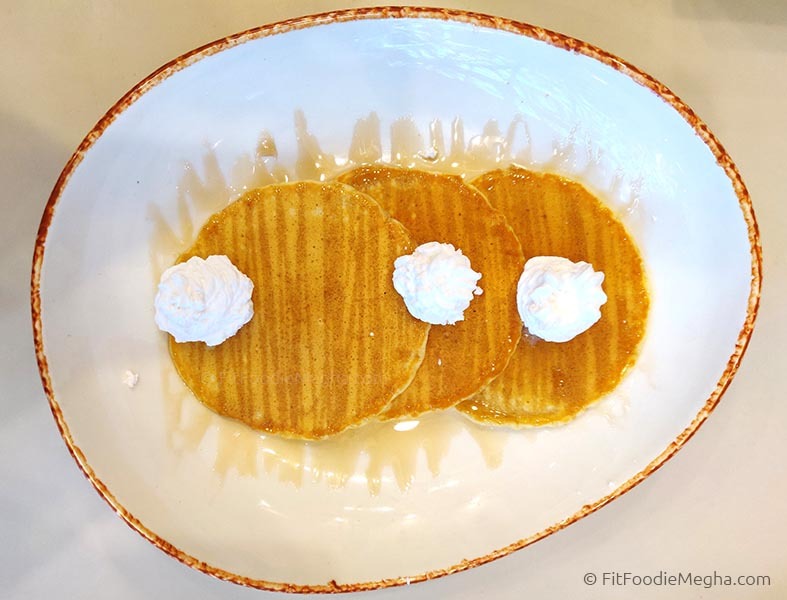 Last but not least was the Classic Pancakes (Rs.175). 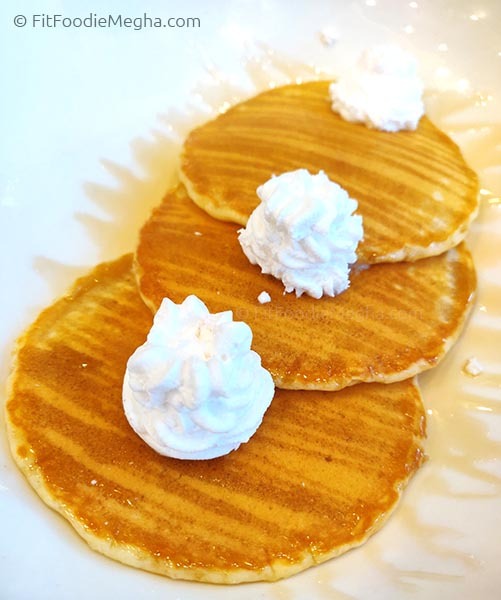 Basic flavoured pancakes were drizzled with butter, honey and topped with whipped cream. Since they were eggless, don't expect the usual fluffiness. Pancakes were nicely cooked though. One can also try the Banoffee or Belgian Chocolate if you want to try sweet ones. 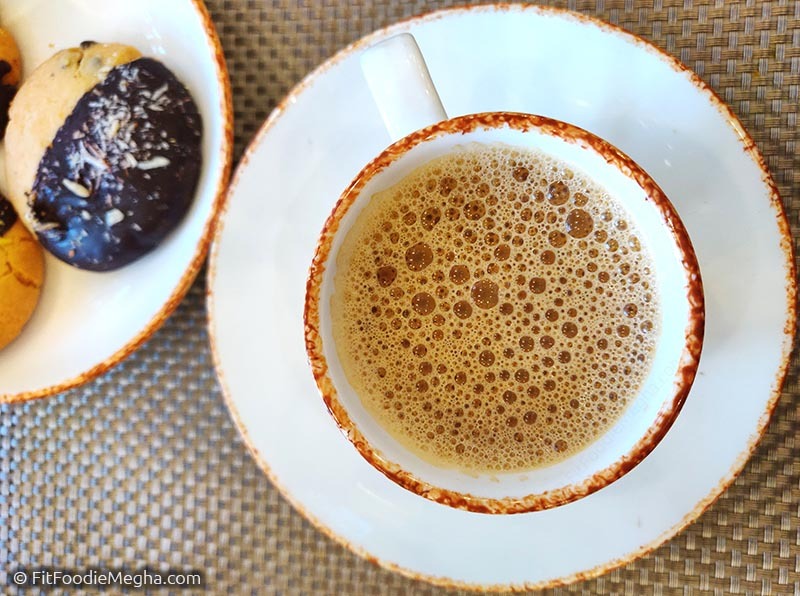 Concluded our meal with the favourite Filter Coffee served with cookies. 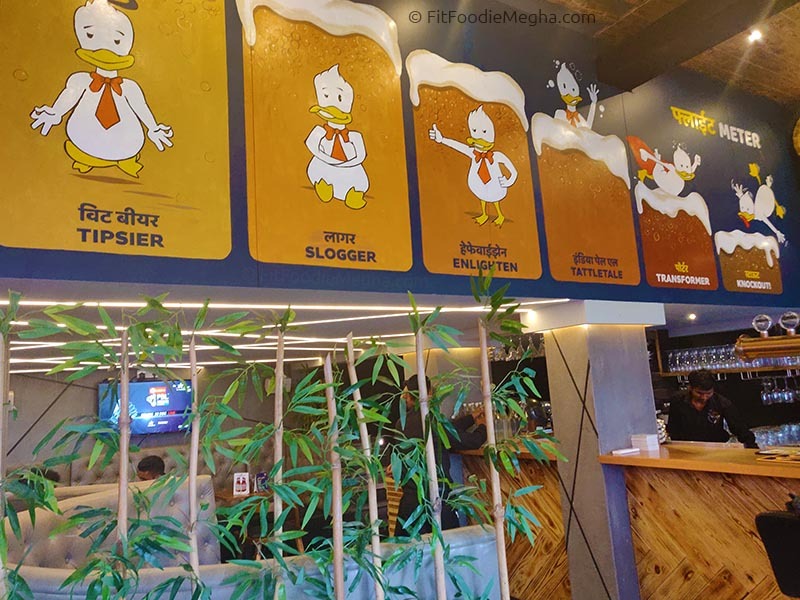 The Tipsy Duckling has come up with a good news for the residents of Kothrud and near-by areas. 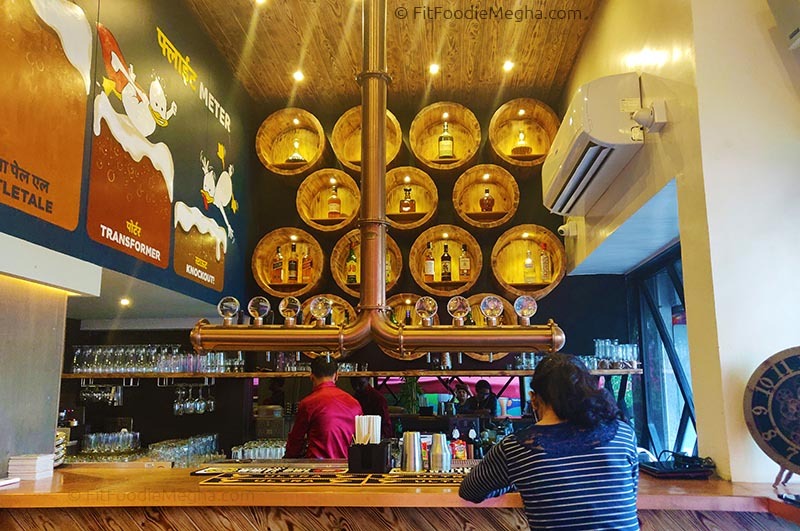 With one of its kind suspended tap and craft beers flowing, the place is surely a benchmark. 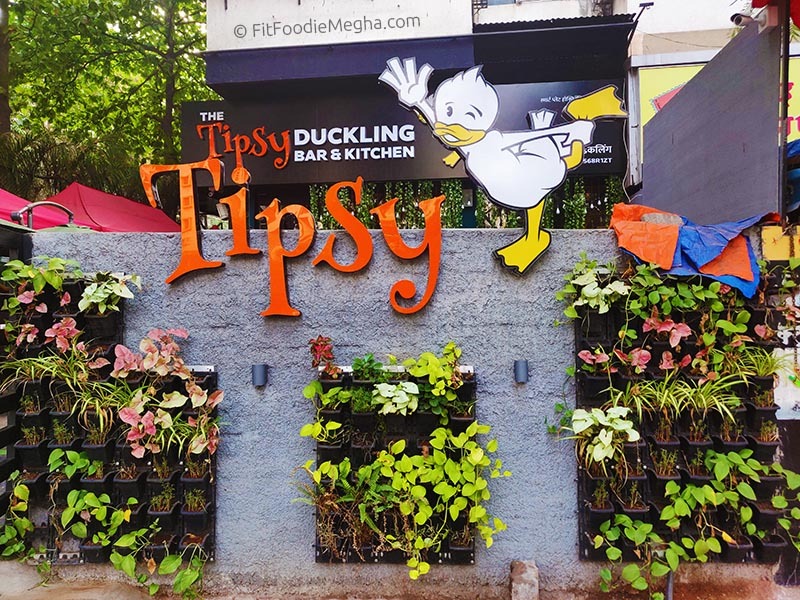 Spacious restro with indoor and outdoor seating, quirky quote coasters, vibrant interiors are the features of The Tipsy Duckling. Two wheeler parking is easily available. 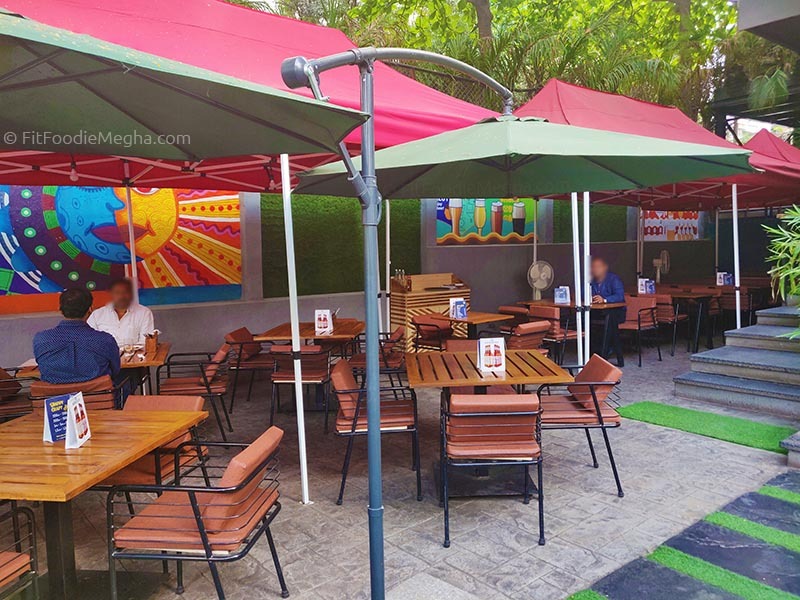 Coming on to the menu, it ranges from Waffles, Poha, Eggs in breakfast to Chana Jor Garam, Mushroom Canapes in bar bites to Small plates, to Pizza, Burgers, Sandwiches, to Indian main course to desserts. Bit confusing but yes, surely it caters and fulfills all the requirements for the kids, friends, families. Because of the bad throat, I had to skip some fantastic mocktails. Started my lunch meal with the fresh Melon and Feta Salad. 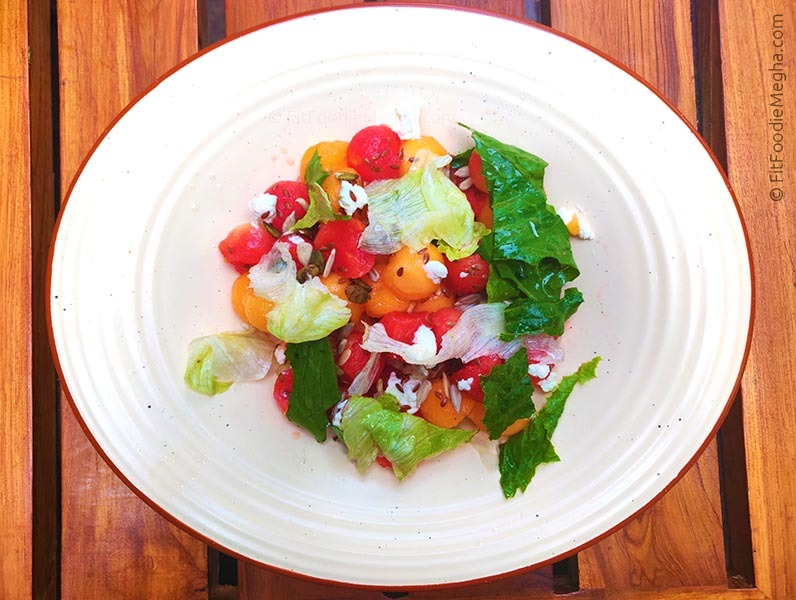 The bowl of salad had roundlets of watermelon and muskmelon along with the crunchy lettuce topped with salty feta and nutritious flax seeds. I wish it had balsamic dressing, walnuts and a generous amount of feta! We all love extra cheese (don't we?!) Haha. 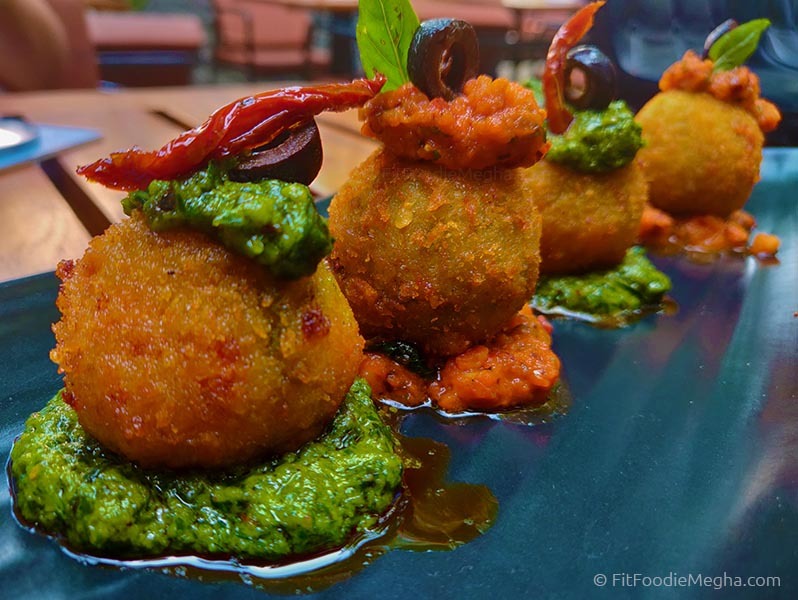 From the Small Bites, we tried Tomato Arancini and Pesto Arancini Balls. Crumb coated, deep fried, tangy Tomato Arancini ball was topped with pesto for the extra flavour. I liked the Pesto balls more. The rice, pesto, and cheese made a hearty filling and the richness of pesto elevated the taste. My personal choice would be Pesto over Tomato Arancini Balls. Thai Cottage Cheese was the result of the fusion of Thai and Indian food. 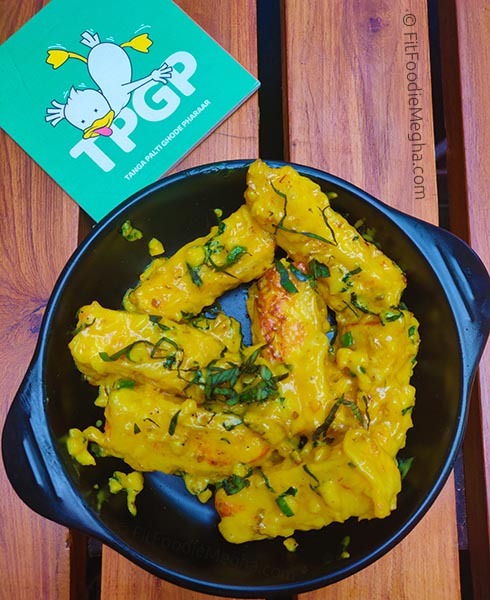 Cottage Cheese fingers are rolled into all-purpose flour, deep fried and tossed in the delicious coconut based Thai sauce. One needs to eat it as soon as it is served otherwise the cottage cheese coating becomes tad chewy. The Thai sauce was super flavourful. The star dish of our lunch meal was the Stuffed Multani Mushrooms. I am not a fan of mushrooms however this dish made me fall in love with one. Stuffing of irresistible ingredients, marinated and spiced to perfection, the Stuffed Mushrooms are highly recommended. 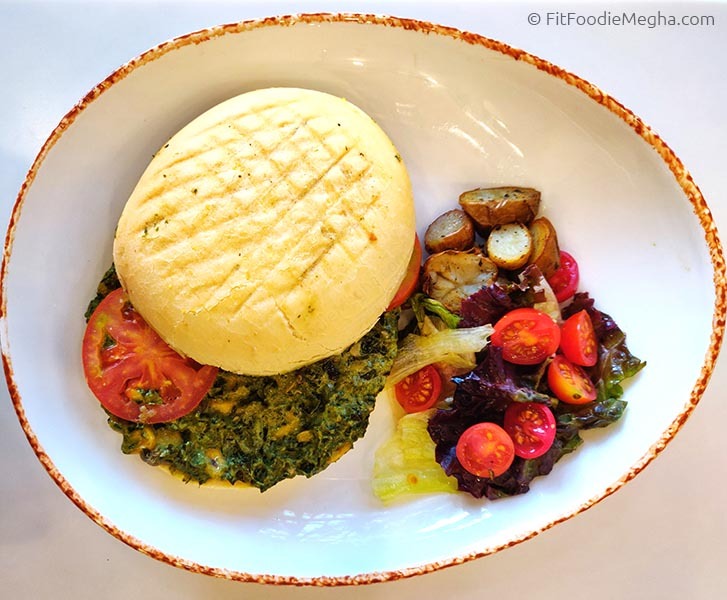 Multani mushrooms had a scrumptious earthy flavour and the texture was just flawless! 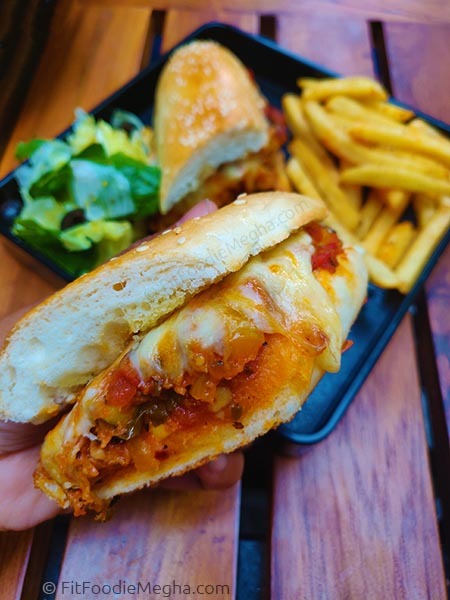 The cheesy Ratatouille Sandwich was filled with veggies and grilled to perfection. Served with the portion of french fries and fresh salad the sandwich was quite hearty in itself. The cheese overload sandwich was a delight for a quick bite. One of the finest Khow Sueys I had here at The Tipsy Duckling. 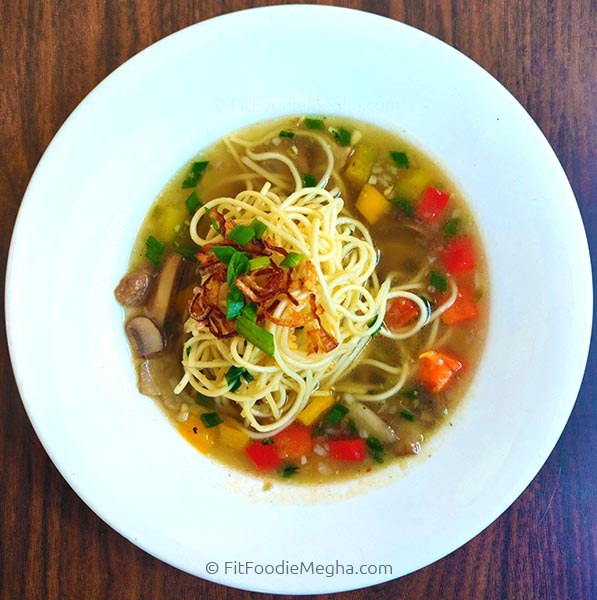 It was the delectable one-pot meal with crispy noodles, veggies in creamy coconut milk. 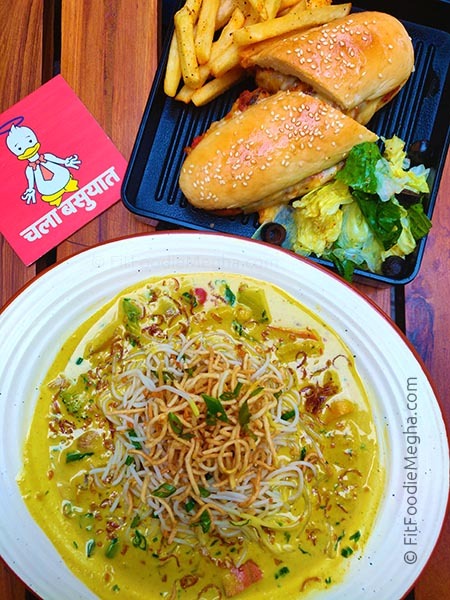 Noodles rested over the scrumptious yellow curry with pre-mixed condiments in a bowl. 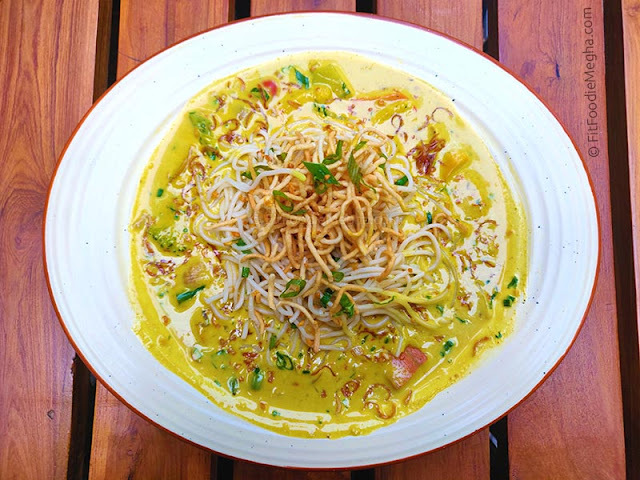 Unlike other places, the khow suey here is ready to eat and the taste is perfect for the masses. The taste still lingers in my mouth. Highly Recommended! 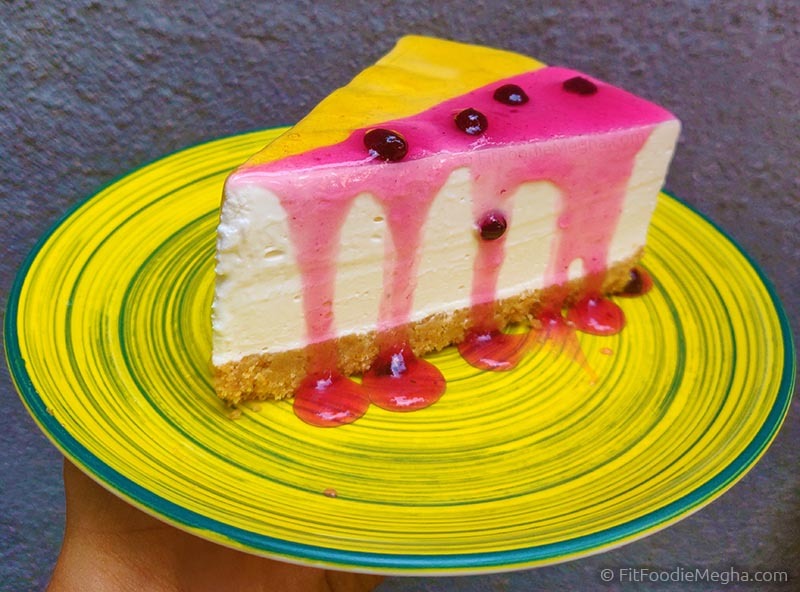 We also tried the half and half Passionfruit and Blueberry Cheesecake. The creamiest, smoothest cheesecake with the perfect buttery biscuit base is loved by one and all. The subtle sweetness and the exemplary texture leaves us wanting it for more. 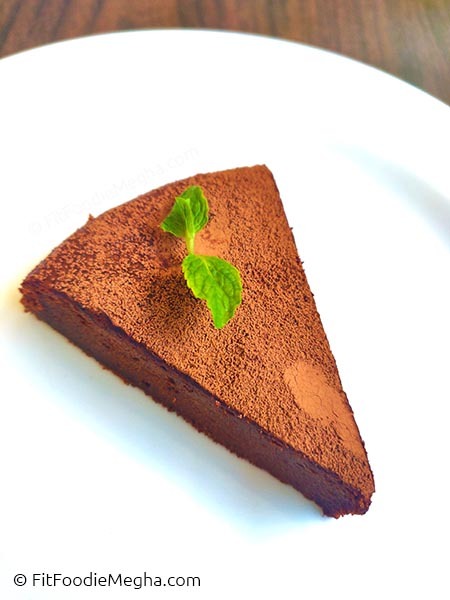 The decadent Mississippi Mud Pie is a delight for chocolate-lovers. 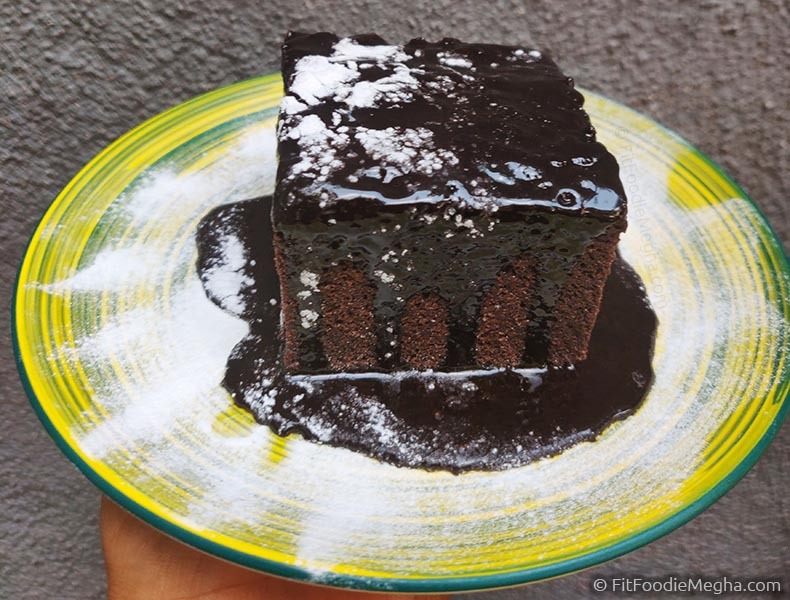 The sinful chocolate sauce was flowing down its way on the luscious, rich layered cake. A must have. 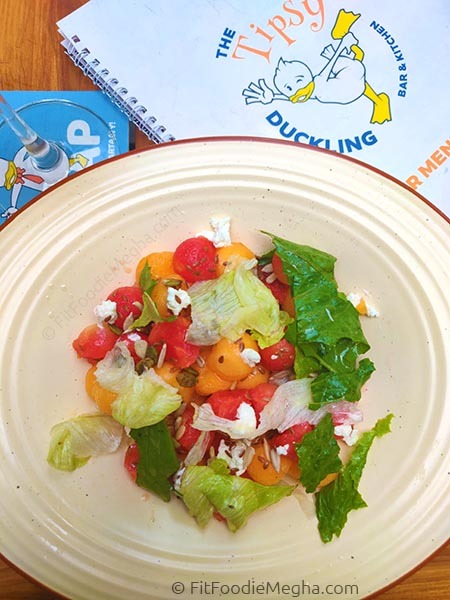 Overall, The Tipsy Duckling is a fantastic place for casual meals or meetings or party. I am planning to visit again to try some of the more exciting dishes from the menu. 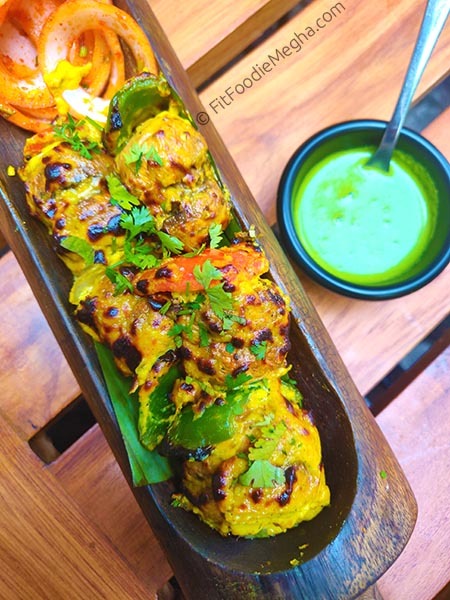 Barbeque Nation - New and Improved! — Reviewed!